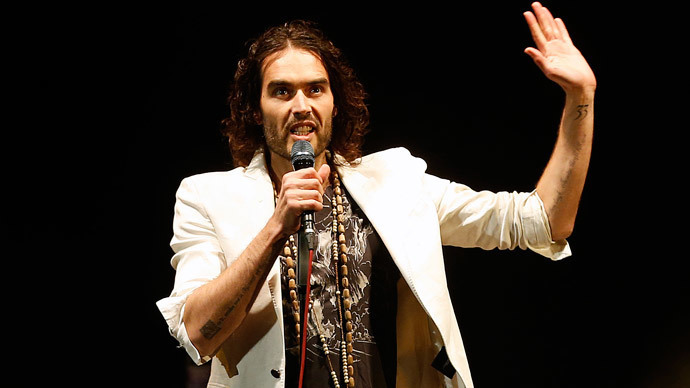 Following a pre-release screening of his new film, ‘Emperor’s New Clothes’, comedian and self-styled revolutionary Russell Brand called the upcoming UK general election irrelevant, claiming political justice is dead. Brand also said public engagement should be based on activism rather than Westminster politics. At the screening in East London, the comedian was asked by ‘Queen’ guitarist Brian May if he really believed the populace should abstain from voting. “It’s not like that mate, it’s just [that] it’s not relevant. We’re going to do this sh*t anyway. What I most support is people becoming activated,” Brand replied. “Watching [the film], I get angry again. Because there’s an election it’s a good time to market a film about politics and people are more aware of politics. The film, made in collaboration with Michael Winterbottom, addresses tax avoidance by large corporations. In January, Brand and his film crew attempted to arrive unannounced at the house of Viscount Rothermere, owner of the right-wing Daily Mail, in protest against the paper’s tax dodging escapades, but were disappointed to find the media mogul was not at home. His visit to the viscount’s home was the second time in a week Brand had publicly attempted to gatecrash someone on his “hit list.” In late December, he paid a visit to the Royal Bank of Scotland’s London headquarters, where he protested against the bank’s taxpayer bailout. Brand has previously urged the public not to vote, calling for a total overhaul of the current political system. He has been challenged, however, by the Church of England. The established church’s highly politicized pastoral letter attacked Brand’s style of activism, criticizing his attempts to “exploit grievances” of the electorate and “find scapegoats” in political life. In the letter, the first ever to be delivered before an election, bishops urged the country to vote on May 7, saying it was every Christian’s duty to do so, and tackle head-on the growing problem of detachment from politics. Brand’s film will be released publicly on Friday.